Thanks to our friends Mical and Tim (and Dora the super-dog), we'll be going to a Seder tomorrow evening. I've always loved going to Seders. Perhaps it's my love of horseradish? Perhaps my strange attraction to gefilte fish? Or perhaps it's being allowed to have some naughty, illegal wine. Either way, it's a good thing. In honor of the upcoming holiday, my poetic offering for the day is "Why do I remain in Exile?" by Nicholas Gordon, a self-published e-author. 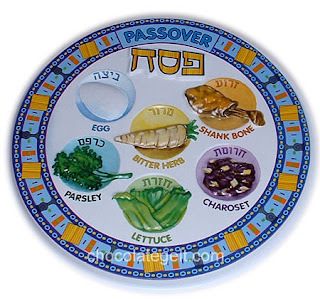 Especially with the 60th anniversary of Israel's current incarnation coming up, it seems especially apropos to the part of the Seder where one says "Next Year in Jerusalem." Why Do I Remain in Exile? I say, "Next year in Jerusalem!" Seders come and Seders go. I feel the pull but not the pain. I do not mean it, not for real. My anguish must be self-imposed. I mean it in my Jewish bones. I lie becalmed, and wait, and wonder.